Introduction to Academy Awards and Best Pictures: The Academy Awards®, affectionately known as the Oscars®, have been presented annually since 1927 (the first awards ceremony was held in May 1929) by the Academy of Motion Picture Arts and Sciences (AMPAS). For the 1927/28 through the 1950 Awards, the nomination and 'Best Picture' Oscar went to the production company or studio that produced the film. [For example, Gone With the Wind's Best Picture Oscar was officially presented to Selznick International Pictures, not to David O. Selznick.] Thereafter, the 'Best Picture' Oscar was given to the producer(s). In the first year of the awards, there were two "Outstanding Picture" winners: Wings (1927/28) for Best Production and Sunrise (1927/28) for Unique and Artistic Picture (a category that was immediately dropped). Obviously, the first and only silent film to win 'Best Picture' was Wings (1927/28). The Artist (2011) was mostly-silent, although had a soundtrack with sound effects, music, and a few characters speaking dialogue at the end. At the 1928/29 Academy Awards (held in 1930), no film won more than one statuette (there were seven films honored in seven categories) - something that hasn't been duplicated since. Two Best Picture-winning films, Titanic (1997) and All About Eve (1950), both hold the record for the most nominations (14) earned by a single film. 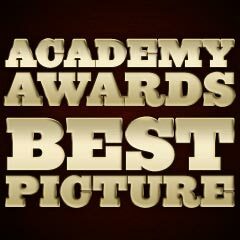 The Lord of the Rings: The Return of the King (2003), Titanic (1997), and Ben-Hur (1959) are the three Best Picture-winning films with the most Oscars wins (11). The closest Best Picture winning runner-up for most Oscar wins was West Side Story (1961) with 10 Oscars (out of 11 nominations). Titanic's awards included two sound awards and no acting prizes, and its screenplay wasn't even nominated. On the other hand, All About Eve (1950), also with 14 nominations, had one acting Oscar (Best Supporting Actor for George Sanders). And Ben-Hur (1959), with 11 Oscars from 12 nominations, lost only its screenplay nomination, plus it racked up two acting awards (Charlton Heston for Best Actor and Hugh Griffith for Best Supporting Actor) - and there was only one sound category in 1959. The Lord of the Rings: The Return of the King (2003) won Best Adapted Screenplay, but had no acting nominations in its clean-sweep win. The Matrix (1999), not a Best Picture nominee, also won 4 for 4. And Grand Hotel (1931/2) was the only Best Picture winner to receive only one nomination. It was the only film to win Best Picture without receiving any other nominations. They Shoot Horses, Don't They? (1969) holds the record for receiving the most nominations (9) without being nominated for Best Picture. Its sole Oscar win was Best Supporting Actor, for Gig Young. But They Shoot Horses, Don't They? (1969) didn't have the most Oscar nominations in its year of competition. In the same year, Anne of a Thousand Days (1969) had more nominations (10), but it was nominated for Best Picture. Therefore, Dreamgirls (2006) with 8 nominations was the first-time ever in Academy history that the film with the most nominations in its year failed to earn a Best Picture slot. Crash (2005) marked the first time a film-festival acquisition (after its premiere at the 2004 Toronto Film Festival) won Best Picture. There is a long-standing idea that the Golden Globes (set up by the Hollywood Foreign Press Association) are predictive of Best Picture Oscar wins, but that is mostly a myth. In the decade of 2001-2010, A Beautiful Mind (2001), The Lord of the Rings: The Return of the King (2003), and Slumdog Millionaire (2008) were the only three Best Picture dramas to win both major prizes. Before then back to the 50s, just over 50% of the Golden Globes' winning Best Picture dramas were repeated on Oscars night. From 1951-2000, they had agreed on 27 out of 50 Best Pictures (32 out of 50 if you also include the Globes' Best Musical or Comedy category). The Best Picture Oscar nomination (and subsequent) win for a solid blockbuster film such as Gladiator (2000) or The Lord of the Rings: The Return of the King (2003) helped boost the bottom line, but not as significantly as it would have for a lesser-known film.